Agenda: I think keeping a well organized life, either for school or not is important, and even though I am a computer-savy girl, I like to keep everything hand written for better remembering! I could not live without a proper agenda! I love these agendas. I am ordering one with next weeks pay! Though her agendas are ore on the pricey side, I can really justify it, because it is something you will use for over a year! Though if it is out of your price budget, or you just can't see spending $20+ on a agenda, there are many other options from staples, to target, to barnes and nobel, to walmart! And everyone has cute designs especially around the beginning of school! MacBook Pro: Having a computer in college nowadays is a necessity. I take my computer to most of my classes, especially the ones where I take a lot of notes, or I have my e-books on! And really I type a lot better and faster than I write. So I will be carrying my MacBook Pro along with me everywhere this semester! Wristlet: This goes along a lot with a backpack. But I cannot really ever carry a purse around school. I usually choose either a purse or a backpack. For days I know I don't need anything I will carry a purse. But for days I know I need my books and/or laptop I can't justify also carrying a purse. On those days I switch over my phone, and ID card/debit cards to a Vera wristlet. I still have mine from 2 years ago! They last forever, and they are a really timeless investment! Watch: No way would I ever be able to drop a couple hundred on a M Kors watch, but I think a watch is a great accessory to have, even though I rarely look at mine for the time. But when I wear a watch I feel a hundred times more intelligent and proper than when I am without. Backpack: Of coarse if you go to school you need a backpack. Some people get around with carrying a purse, but they are crazy. The straps on a purse are not made for books, and I don't want my perfume to break all over my notebooks and things! Having a good backpack is key, and if you get a good one, example: Jansport, it will last for years to come! 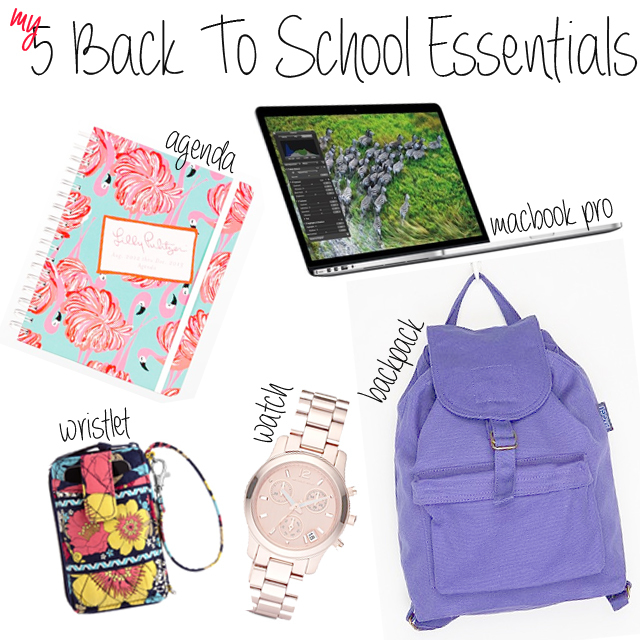 What is your number one back to school essential??! Hi , Just wanted to let you know I've nominated you for a Liebster Blog Award! If you head over to http://www.tanicetalksaboutthings.blogspot.co.uk/2012/08/liebster-blog-award.html you can take part!